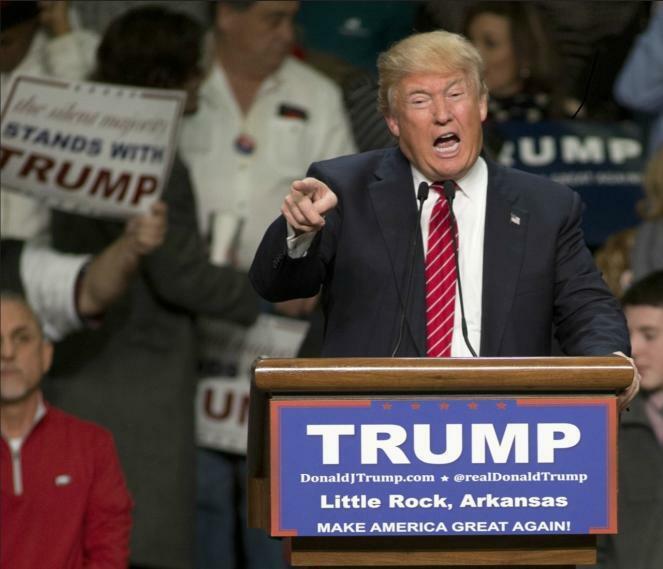 KUAR's Jacob Kauffman reports on Donald Trumps second visit to Arkansas for the GOP presidential contest. Donald Trump speaking at Barton Coliseum in Little Rock, Arkansas. Republican presidential candidate Donald Trump told thousands in Arkansas Wednesday night that the Clintons have abandoned their home state. Trump also further laid out claims Texas Senator Ted Cruz stole the Iowa caucus. “Give it up, for your next president of the United States of America, Donald J. Trump! Yes! Yes! Yes!," shouted Trump's opening hype man Jonathan Conneely, the founder of a fitness regime for first responders who calls himself Coach JC. Barton Coliseum was ready for Donald Trump but the announced crowd of 11,500 had to wait well over an hour because Trump's personal plane was hampered by mechanical problems in Tennessee. It caused him to miss a meeting with Arkansas Governor Asa Hutchinson. When he did arrive those on hand made him feel welcome. The New York City billionaire wasted no time tailoring his pugnacious style to the Arkansas locale, the former home of Democratic candidate Hillary Clinton . He took to twitter the morning of the rally and said the caucus should be re-held. Trump talked out his claims with the crowd. First criticizing a mailer form the Cruz campaign. And he commented on Cruz staff suggesting Ben Carson was dropping out of the race. That messaged resonated with Mike White who traveled from Memphis. He waited nearly five hours for doors to open and 7 to hear Trump speak. “Cruz showed his true hand in Iowa. The crook and the liar that son of a gun is, he showed his true hand. He ought to be selling used cars instead of running for president. He is a piece of…work,” said White. By now Trump’s biggest themes are well known from Iowa to Arkansas. 68-year old Seth Pomeroy of Maumelle said Trump stands for an American identity. “Whose coming into America, what’s happening to us? I’m watching everybody just sit around. Borders, language, this is our lives. If we lose our culture we lose our country. Who are we? I feel Trump is trying to define that,” said Pomeroy. Arkansas heads to its primary March 1 with 14 other states, six of them Southern. The contest in Arkansas is considerably more open since former Governor Mike Huckabee dropped out of the race after Iowa. Watch Trump's full speech here. Who Will Get Huckabee's Arkansas Endorsements? Former Arkansas Governor Mike Huckabee is out of the Republican presidential primary and now his many endorsements from home-state officials are up for grabs before the March 1 Arkansas primary. Most of his supporter list said it’s premature to endorse a new candidate. But Lieutenant Governor Tim Griffin, while withholding a formal endorsement, heaped praise upon Marco Rubio during an interview with KUAR. We'll find out in a few hours just how premature it is to be considering Hillary Clinton's VP but one heavily-speculated about candidate's brother is headlining a campaign kick-off for two northwest Arkansas legislative candidates a few days after the Arkansas primary. James Carville In Arkansas, Is Hillary Clinton Southern? A Clinton bid for the presidency brings up plenty of familiar feelings for Arkansans and an old voice is back in the state this week to help raise funds for Hillary Clinton. James Carville made stops in Little Rock and Rogers on Thursday.